UPDATE AS OF FEBRUARY 2017: PLEASE CLICK HERE! 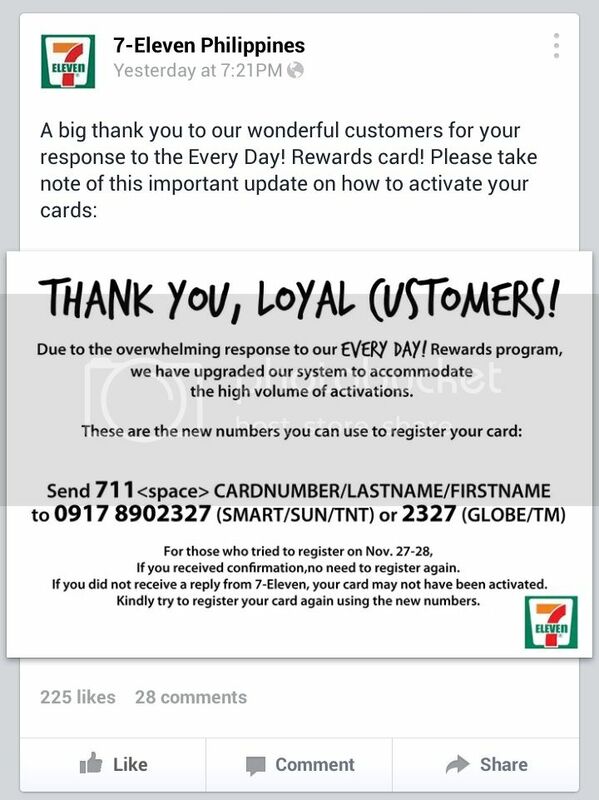 This week, 7-Eleven Philipines came up with a “reward card”. The kuya behind the counter said it’s “like SM Advantage card”. His words, not mine. Anyway, since I frequent 7-Eleven anyway (there’s one just outside GMA where the personnel are the nicest! ), I got one. It technically costed Php10, but you’ll also get Php10 rebate/GC. So, it’s free. Anyway, you need to activate the card. It’s sort of a registration process done through text. Except that the number stated on the instruction thing which came with the card was wrong. I’ve been trying to activate my card for days now (even blamed Globe. Sorry, Globe! ), but the text just wont send. Good thing I visited their facebook page. They have another numbers pala. Here you go guys. You’re welcome. It worked well for me. Minutes after sending the text, I received a text message with a PIN. You can then use this PIN to register an account online (here!). You can monitor your point through that page. I just wish they’ll come up with more eggzayting rewarda – like those The Hobbit USB flash drive I didn’t win last year. what if , i already activated my card 2 yrs ago but accidentally my cellphone number that i used to register my 7-11 account was lost.. how can i retrieve my account balance points? please do reply… thank you..
Ganyan dn prblema q..wala n ung # n gnmit q pagregister..pero nskin pa ung everyday card..
panu po magavail ng everyday reward card ..
How about po yung naiactivate ko na yung card, 4 months ago through text, and madami na syang points pero niregistered ko lang po dun sa number na andun, ma reretrive ko pa po ba yung points ko if ever di po sya nag register? Pero I try to call the number that was placed at the back of the card and nag riring sya but no one’s answering. is it possible to retrieve old points?i lost my card,its registered to my old cellnumber..that cell number no longer exists.can the points be transferred to my new number?i still know my old cellnumber except for the 711 card number.i checked and the oldnumber has points.. I do not have a phone with “apps” . No smart phone . Only a “safe link” phone . It will not let me register without one !! TOTAL scam. Charge high prices and offer a kickback. EXCEPT, will not accept mobile phone numbers unless you own a smartphone that can download their app. WTF? Another ‘come on” by another rip off company. AVOID THE FRUSTRATION OF REGISTERING A 7-ELEVEN EASY PIONTS CARD. argh !!!!!!!! 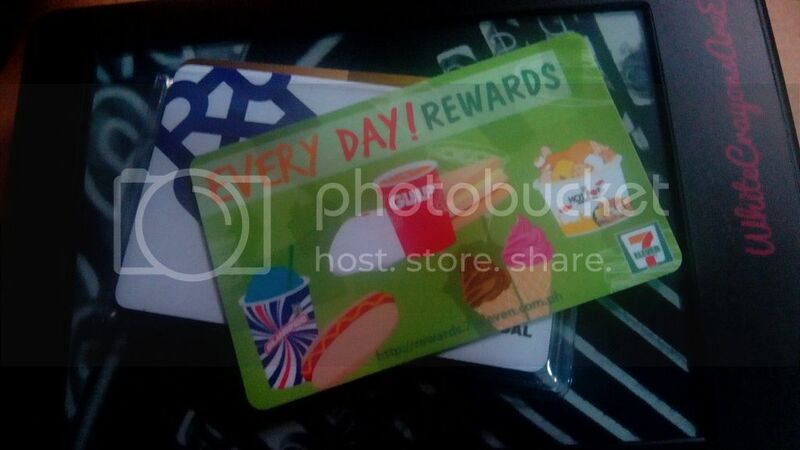 Paano po ang gagawin para ma gamit ko uli ang every day rewards card ko.hindi ako mKa redeem dahil nasira young phone ko dati kasama na yong code, hindi ho na magamit pag walang code.